I remember when I was younger and it was Mother's Day or Father's Day, I would always moan to my mum that it was unfair that parents each had a day, but children didn't get one. She answered that the reason was because every day is children's day, which cut that argument short. But here in Korea, everyone's celebrated on their own particular day. There's Parents Day, Children's Day and this year I discovered the wonder of Teacher's Day on May 15th. Teacher's Day is the day when students give thanks to the ones that teach them. Apparently lots of middle schools and high schools close after lunch time, so students can go back to their old schools to see the teachers that made an impact on them when they were only a couple of feet high with their hair in pigtails. It was nice to see all of my old 6th graders around school yesterday, as they ran up to their old homerooms. 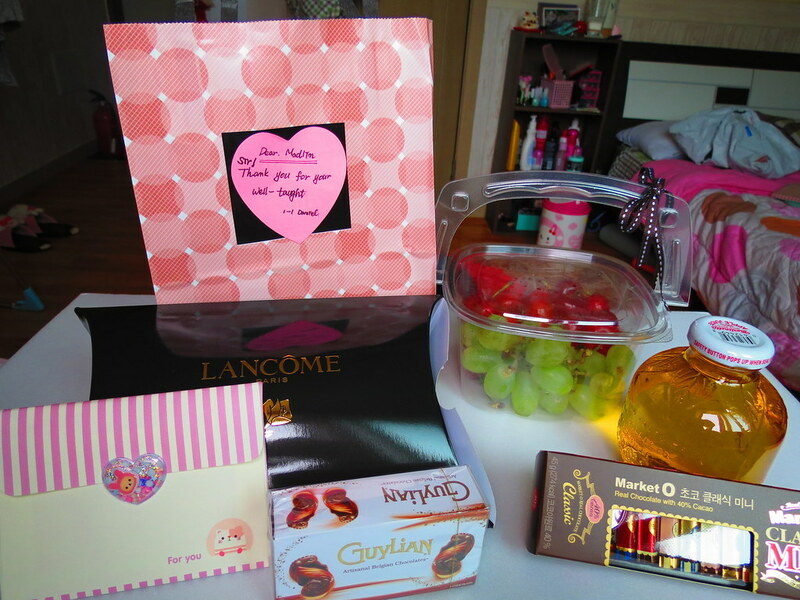 To make things even better, our current students showered us with gifts, including a basket of grapes and cherries, apple juice, sun cream, Lancome make up and chocolates! One of the gifts from the 1st graders had a little hand written note calling me sir, then thanking me for my 'well-taught'. So cute! Last year I didn't receive anything, and I was told by my co-teacher that the higher grades tend to only give things to their homeroom teachers, so it was really nice to receive a letter from one of my 6th graders this year. It's nice to know on days when you feel like you're talking to yourself while the rest of the class get on with their own business, that someone appreciates it! I'm off on my travels tomorrow morning, so I hope that everyone in Korea has a great long weekend! I know! It's so cute! She's in 6th grade and really really smart. 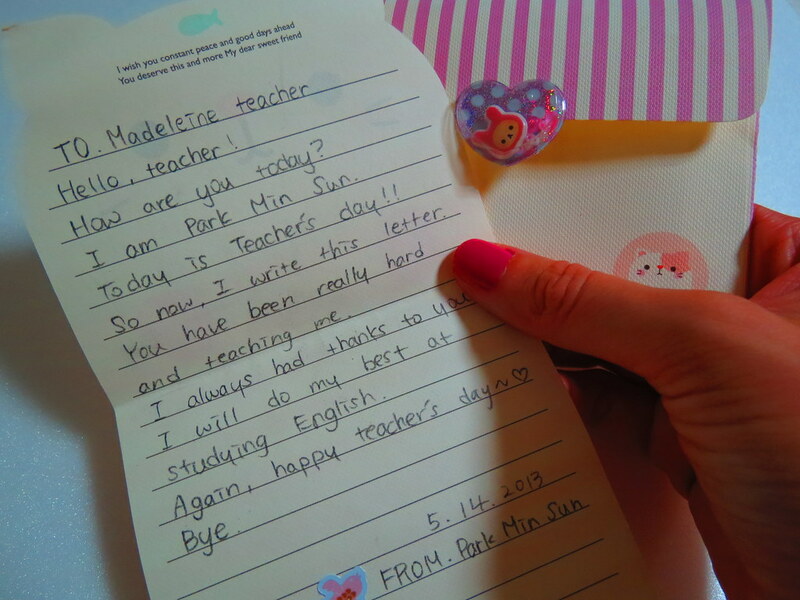 She was one of my favourite students, but now she definitely is after the letter! !